Also available in PDF format from Software Diagnostics Services. The full transcript of Software Diagnostics Services training. 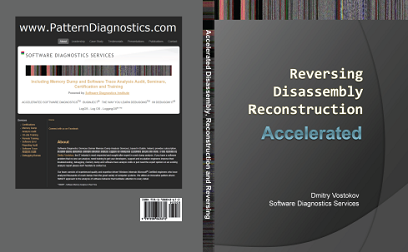 Learn disassembly, execution history reconstruction and binary reversing techniques for better software diagnostics, troubleshooting and debugging on x64 Windows platforms. The course uses a unique and innovative pattern-oriented analysis approach to speed up the learning curve. The training consists of practical step-by-step hands-on exercises using WinDbg and memory dumps. Covered more than 25 ADDR patterns and many concepts are illustrated with Memory Cell Diagrams. The prerequisites for this training are working knowledge of C and C++ programming languages. Operating system internals and assembly language concepts are explained when necessary. The main audience for this training is software technical support and escalation engineers who analyze memory dumps from complex software environments and need to go deeper in their analysis of abnormal software structure and behavior. The course will also be useful for software engineers, quality assurance and software maintenance engineers who debug their software running on diverse computer environments, security researchers, malware and memory forensics analysts who have never used WinDbg for analysis of computer memory.